Saturday: Mostly sunny. Wind chills in the 30s. Highs in the mid to upper 40s. Saturday night: Clear, cold. Watch out for black ice. Lows in the 30s. Sunday: Clouds increase. Highs in the low 40s. 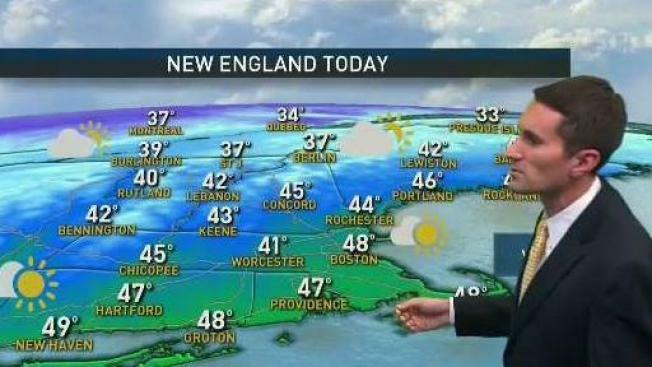 After yesterday’s snow, New England enjoys a mixture of sun and clouds with temperatures in the 40s today. There still may be some snow showers in the mountains of Northern New England, as many ski areas open for the season. Overnight temperatures drop into the teens and 20s north, with 20s and 30s south. Sunday starts with sunshine, but clouds increase as a weak disturbance approaches. That will trigger some snow showers late in the afternoon and during the evening in Western New England. Those spread east overnight, into parts of New Hampshire, Maine, and even the Merrimack Valley. South of Boston it will be warm enough for overnight rain showers. Expect 1-3 inches in those light snow showers, which will mostly be out by the Monday morning commute. Highs on Monday will be in the 40s, but we drop into the 30s by Tuesday. A reinforcing shot of cold air arrives Tuesday night into Wednesday with some more snow showers. That too looks fairly light, and shouldn’t significantly impact holiday travel. Thanksgiving looks quite cold but bright. Expect highs in the 20s and 30s.